Well, I have to say it’s been a funny old day. I found out the answer to the question of ‘what does one do in a blizzard with a foot in a pneumatic boot?’ The answer is ‘relatively little, except worry about those who are out in it’. Nothing too earth shattering there. We were lucky enough to share part of the day with friends who skied up here with Garnet and The boy following on snow shoes and an initially reluctant Monty, trying to (unsuccessfully) bound through the snow. 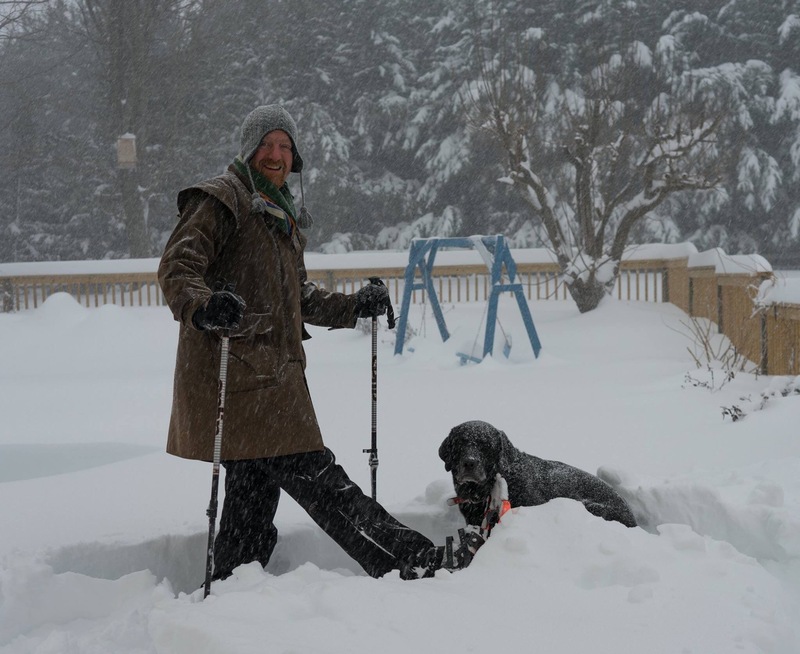 Even an experienced dog like Monty cannot bound through snow so deep it almost covers him. The house is quiet – there are no noises from outside because there is no way to drive in this, therefore nothing is open, not even the main road. The snow makes an eerie glow in the parts of the windows that are not covered, and made the house darken early as it covered the panes downstairs. Some silences make your ears hurt as you strain to hear familiar sounds – this is one such silence. It is still snowing slightly out there but not enough to significantly alter the total of 36 1/2 inches (94 cm). Some parts of the local interstates are now closed, but I think we are nearing the end of the storm. We were prepared enough to get through it, we had enough food and wood etc. The only trouble is, what happens now? We have 6 foot drifts outside the garage, so getting out is going to be a nightmare. However I think I know the answer to he question of ‘what can someone with a pneumatic boot do to dig out after a big storm?’ – the answer, as above, is ‘relatively little’.